• Headlines »Total Fishing Gear bait range formulated with Matt Hayes and available now. This year is about the formulation of a new bait and the beginning of my fishing as a member of the Ashmead syndicate. 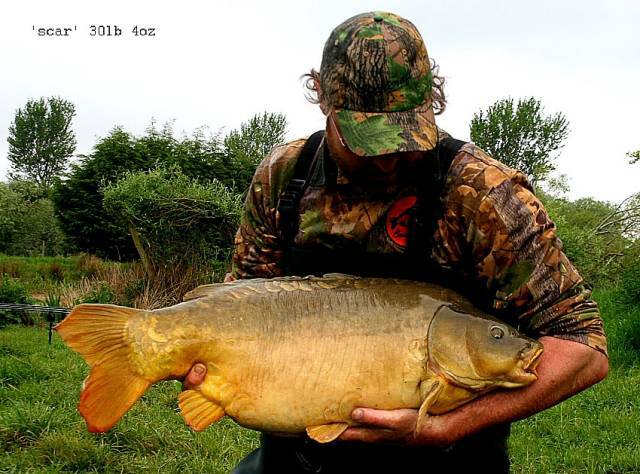 The challenge of starting from scratch on a new venue is always exciting, and it seemed right to put a new bait together and try and give the fish something they have never seen before. The water is very rich and weedy and supports a fantastic number of 30lb-50lb fish so the prizes are there for the catching. Added to the fact I want to catch the fish, I also want to grow them on a bit so digestable protien is of the foremost importance in this bait. As the lake is over 100 miles from home I intend to make a distinctive bait they should recognise from one trip to the next. I dropped in and scattered 5kg of bait in some likely looking spots on the saturday afternoon, then planned the first trip for the following Friday. We managed to get all the rolling done on time so I jumped in the car and went straight from work on the Thursday. Arriving at the lake to a bitter cold east/north east wind I set up on the back of it, put about 3kg of bait in a tight spot and fished on and around it. 4 hrs later and a steady run on a hookbait cast 5 meters from the bed gives me the ultimate boost in confidence - a perfect 23lb mirror. The bait was acceptable to the fish so the attrator package was ok (little high maybe as it was a quick pick up). I want to change the colour a few shades so they blend in even better with the bottom, and tweak the ingredients but version 1 passed the test. I changed the bait colour from the natural fishmeal colour to a dull olive green and set off once again towards deepest Somerset. 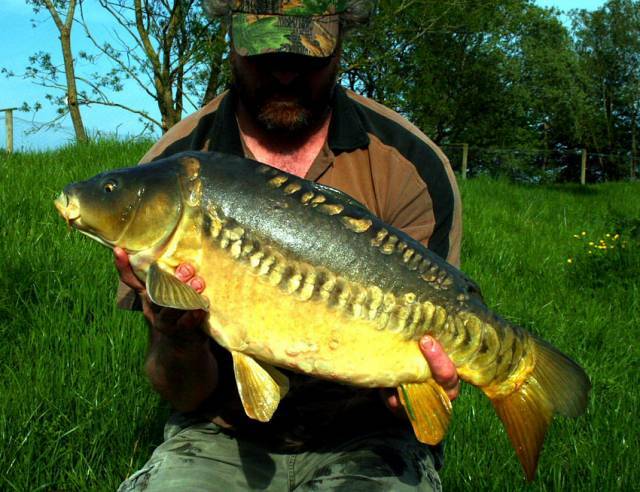 It was the first week of May and the fish were visible all over the lake, feeding, cruising, basking and behaving like carp should. I set up on the shallows and decided to pop the chesties on and go for a walk around in the lake. The lake was deserted so it was worth spooking the fish a bit to learn more about the lake bed while not disturbing any anglers. The bottom was very silty on top of the clay but a few areas were cleaned off and one area was hollowed out to a bowl - obviously it had recieved a lot of bait but probably pressure too. I had a 20kg dry powder batch with me, about 29kg of rolled bait, so I created one big baited area with about 10kg and three other tighter patches of about 3kg each. This lets me rotate the rods and constantly rest one of the baited areas to give the fish confidence to feed on a spot with no line in the water. Having been in the lake and put all the bait in etc there seemed no rush to cast out so I set up a stalking rod and took a mooch down the margin. After about an hour I managed to get a few nice fish feeding and with a little luck seperated what looked like the largest from the others. One cast and a stunning linear of just over 20lb took the bait and was soon on the bank in the evening sun. With a quick fish under my belt it was easier to relax and set the main rods up. By dawn 3 small commons between 3 & 10lb had found the bait to their liking, the smallest was a stunning little shouldered fish - once it gets to 40lb it will be something very special inded. Just before 9am it was obvious a much bigger fish had joined the feeding spree and in the blink of an eye the line is whipping off the reel as a chunky mirror heads for the island. Soon the fish is heading back my way but it ends up in the back of a large surface weed bed, stuck solid with no feeling coming through the rod. With no delay I jump into the waders, grab the net and rod and head off to meet the fish. This is a far better option than putting too much pressure on the fish and hookhold, especially as I had a fair idea what was on the end. Once I was close to the fish and with the line above it there was a huge splash and the mirror was free to battle once more. I stayed in the lake and soon netted a solid looking carp that turned out to weigh over 30lb - what a superb day, my first Ashmead 30 and it turned out to be a male carp known as 'scar' and for the record went 30lb 4oz. With the safe return of scar it was time for breakfast, followed by a shift around of the rods as the fish had left the shallow bay and the water had cleared. For the day I topped off a couple of the dull green hookbaits with small 10mm yellow pop ups, wondering if the brighter spot may produce a take from a curious fish throughout the day. Lunch time arrived and a few fish moved from the nearby weedbed and started feeding. 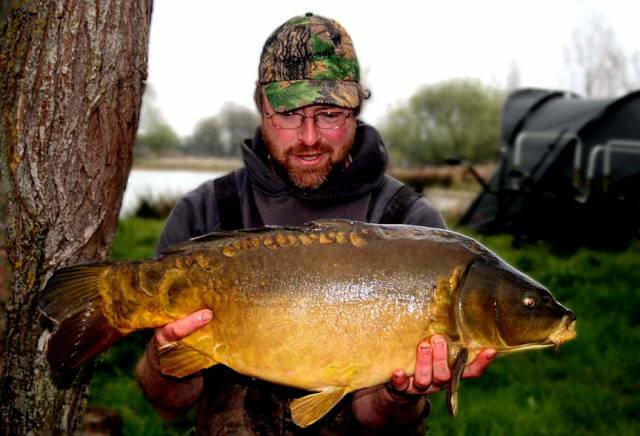 Every so often oily boils came up from the baited area as the fish were finding the bait to their liking. With the building activity over the main bed I had all three rods in the same area and it was a single bait that ended up getting picked up just after midday. I managed to steer the fish away from the surface weed so there was no need to get the waders on and after a few minutes a large framed common was in the net. I quickly weighed her (27lb) and took a few quick snaps before starting to pack up. 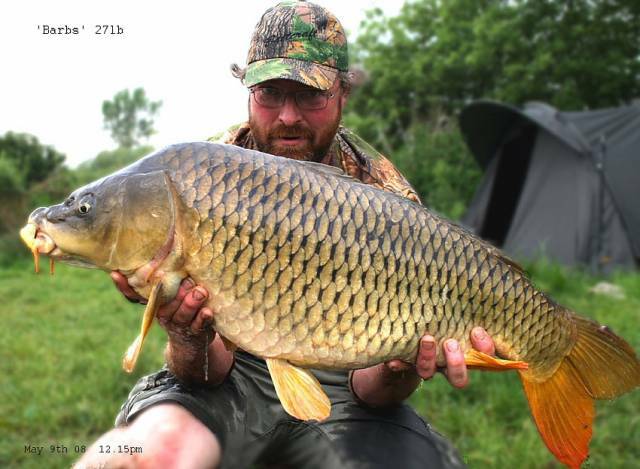 In just under 24hrs 6 carp had slipped up including single/double/twenty/thirty. Six weeks later and it was time to pay my next visit o the lake. The work was all but compleed on the fishery and it was back to its' original 17acres or so. The fish had spread throughout the entire lake and after half an hout or so I'd found a couple of fish mooching along the margins of the far channel. With the gear barrowed into the swim I spread 4 or 5 kg of 21mm baits across the width of the channel so any fish passing through had to pass over the bait. The swim was a bit disturbed after setting up the bivvy and baiting up so there seemed no hurry to cast out, although two new fish cruised into the swim from the back of the island and disappeared over the baited area so it seemed I had got away with setting up without emptying he entire swim of fish. 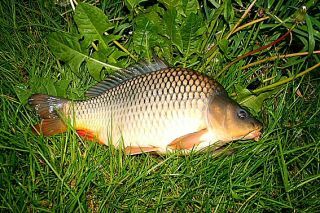 I have far more confidence fishing over a fair bit of bait - it makes the fish drop their guard, making them far more likely to slip up on a hookbait. 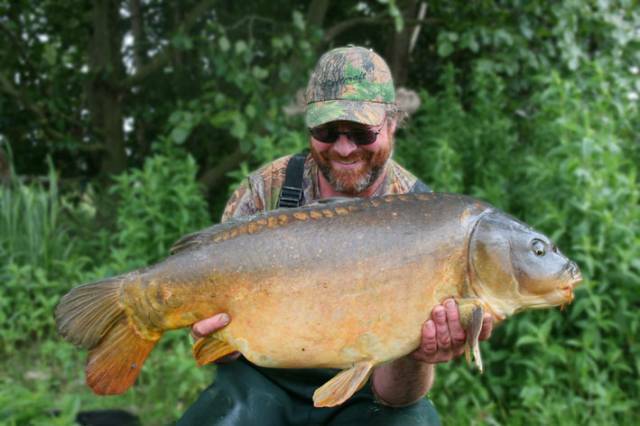 Once the fish have eaten several hundred free baits they will take the hookbait without hesitation. 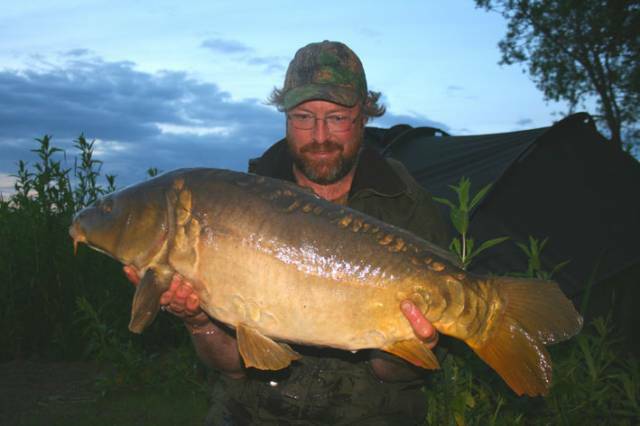 By enducing confident feeding there is no need for any special rigs, just a knotless knot, long hair and a light lead. I use about 5ft of ESP leadcore and a small flying back lead to keep the rig pinned down. The long length of leadcore is important as line bites can be a problem with the big bed of bait. There was a warm westerly wind and a clear sky, perfect conditions for stalking so the next few hours were spent searching the thick weedbeds in the central section of the fishery. Several small commons were soon onto the floaters but the 30lb common that was with them refused to start feeding so I moved up to the far end of the lake and sprayed loads of floaters over the entire ripple. The wind carried them down the lake over the top of several sunken weed beds and within half an hour 5 or 6 original fish were feeding with the small commons. The largest fish I could see had very white pecs and a white bottom lip. Over the next hour I managed to drift 50 or 60 floaters to this fish and it was feeding incredible strongly, staying on the surface and hunting out every last bait- trouble was it was staying close to the far island and the cross wind would ruin the presentation and take the hookbait to the smaller fish. A quick plan was needed before the fish did the off so i quietly waded across to the island and crept nearer to the fish. To get the angle on the big mirror I needed to creep into a weedbed and just flick the hookbait in the path of the white lips. It all went well and the bait was taken straight away, followed by the fish leaping clear out of the water and powering through several weedbeds. After a few hectic moments a beast of a mirror was in the net- a long solid male mirror of 32lb 8oz - a floater caught personal best. By now the baited swim should have settled so I flicked out the rods for the night ahead. The rest had certainly done some good as the right hand rod was away a couple of hours later and an epic scrap in the narrow channel finally resulted in a long grey mirror going into the net just before dark. There was just time for a couple of pics in the dying light and a quick top up of baits to the right hand side of the swim ready for the night ahead. The fish got their own back in the night with a steady stream of violent liners on the left hand rod, each one taking the light bobbin up to the rod & waking me up every hour or so. The following day the lake was a bit busier and a couple of circuits with the stalking gear soon showed the fish behaving totally different from the day before. All the originals were laying low or hiding in the weed and even the small commons were not feeding properly so it seemed better to quit after the one night and head home to Cornwall to spend the rest of the weekend with the family.